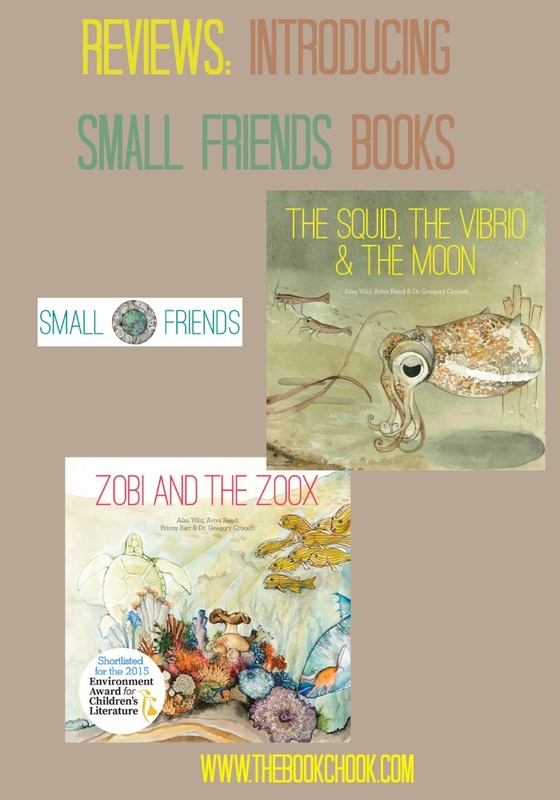 Zobi and the Zoox, and The Squid, the Vibrio and the Moon are two picture books for older readers I received recently. They were published by Scale Free Network, distributed by INT books, and are part of the Small Friends Books. Does the name Small Friends conjure up images of playful puppies or gnomes in cosy homes? Think again! The Small Friends book series tells stories about symbiotic partnerships and cooperation between microorganisms and larger forms of life. I love the concept of symbiosis - two organisms living together to their mutual advantage sounds ideal in comparison to some human relationships! After reading the two books, I feel as if I have a much better understanding of the science behind symbiosis. Zobi and the Zoox was written by Ailsa Wild, and illustrated by Aviva Reed. It tells the story of the microscopic organisms living in a tiny coral polyp on the Great Barrier Reef. The Zoox are a kind of marine plankton and Zobi is a bacterium. They need to try to work together to save their coral home from the threat of the warming ocean. After the story, there’s a huge glossary and detailed explanations of the science behind the story. Reed’s illustrations are simply stunning. She uses watercolour and ink to create incredibly detailed and realistic diagrams and art work to help bring Zobi and the Zoox to life. There are excellent teacher notes to support the story. The Squid, the Vibrio and the Moon was also written by Ailsa Wild, and illustrated by Aviva Reed. It tells the story of the bobtail squid and the bacteria that helps it glow in the moonlight. First we meet Ali, an intrepid Vibrio fischeri bacterium determined to reach safety. Then we meet Sepio, a baby bobtail squid who is still unable to glow. His dark shape is too obvious in the moonlit water and all kinds of predators lurk nearby. Wild has created a story based in fact where the animal characters are truly brought to life for us. They have feelings we can identify with like hunger, fear and boredom. The scene where the tiny bobtail squid is threatened by a lizardfish with its gaping mouth studded in razor-sharp teeth is full of tension and would make a great excerpt to share with kids. Again Reed’s illustrations are delightful, and hugely contribute to the reader’s comprehension. Sadly, there’s a perception in our society that picture books are only for young children. Once kids can read, some people expect them to shun visuals and only allow them to read chapter books. Why? I have no idea. What I believe with every fibre of my being is that picture books make a superb vehicle for learning. Zobi and the Zoox, and The Squid, the Vibrio and the Moon show how complex learning can become more accessible to those of us who don’t have a specialist scientific background. I guess what I loved most about these books is the way the creators succeeded in bringing the story to life, while retaining scientific authenticity. Both books are available in digital versions, or can be ordered as print copies and shipped worldwide. While the publisher indicates they are suited from ages 5 - 105, I see them getting most use with kids from 10 - 15. They’ll make an excellent resource for a Gifted and Talented program, appeal to kids who like faction, and be appreciated by anyone with an eye for beauty in books.